Charming bluebonnets to stitch for a tapestry, applique or for framing. 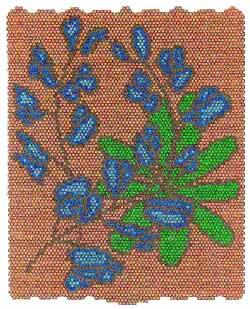 The pattern was created for brickstitch and Delica seed beads but may be adapted for peyote stitch. Clear nail polish may be used to stiffen the finished work. This pattern is for brickstitch but may be adapted for peyote stitch. It can be used as an ornament, tapestry, applique or framed. Clear nail polish may be used to stiffen the item. Miyuki Japanese Delica seed beads are my bead choice as they give a more uniform shape to the project.